Dies R Us: It's Your Day! Yes, it's Wednesday already! I know as the summer disappears, it seems the days are already getting shorter or maybe it just feels that way because we are all getting busier! I've been busy concentrating on my holiday cards this past week, but wouldn't you know it, I had to stop to make a birthday card right in the middle! The card I ended up with was a simple card to make and one you could easily make ahead to keep in your emergency stash. I took a simple image & really dressed it up with the beautiful lacy dies I chose. The dies I used for this card are as Spellbinders Decorative Labels One, Magnolia Doohickey Cute Corner & Cheery Lynn Exotic Butterfly Small. There are 3 butterfly dies in the Cheery Lynn Exotic Butterfly set I used and they have been favorites of mine for years! They are all different sizes & shapes & at least one of them is always perfect for whatever spot I need one. If you haven't stopped at the Dies R Us Store recently, you are missing all the new products we carry now! At last count, I think we carry around 42 different companies along with the European dies that we carry quite often. Be sure you are signed up for our newsletter so you won't miss anything! You won't be sorry! And you won't find lower prices OR lower shipping rates anywhere else! Take it from a die "addict"....I won't shop anywhere else! Once you are finished shopping, head on over to the Dies R Us Challenge Blog & join in for a chance to win a gift certificate! 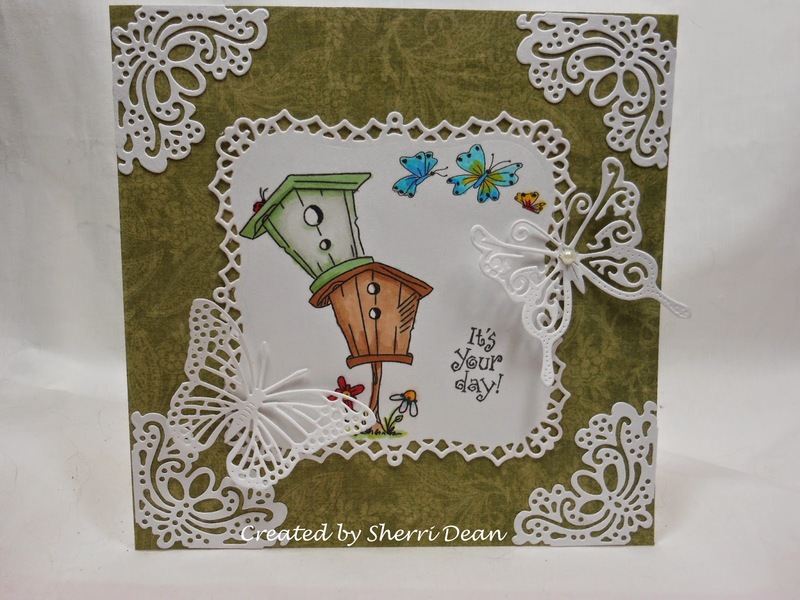 Beautiful card Sherri. I love the fillagree butterflies, very pretty. I love how lacy your card looks, elegant! The birdhouse stamp is super cute!